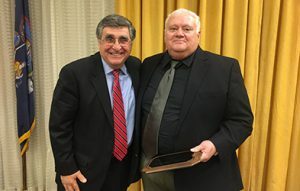 Mr. Paul Puccio, right, president of the Tech Valley High School Operating Board, was recently recognized for excellence in school board service by CASDA. Tech Valley High School Operating Board President Paul Puccio received the first-ever Excellence in School Board Service Award at CASDA’s Regional Education Awards Dinner at the Albany Marriott on April 12. In addition to his service to Tech Valley High, Puccio has served on the Schodack CSD Board of Education since 1980 and the Questar III Board of Education since 1999. CASDA’s annual event recognizes educators and administrators whose tireless energy and selfless dedication are the pulse of our schools.